Sodium sulfate (NaSO4) is commonly known as soda of sulfate. It occurs in the crystal form. It is used in large quantities in various industrial and consumer applications. Sodium sulfate is obtained by mirabilite salt. Synthetic sodium sulfate is produced by lithium batteries and other synthetic process. It is globally manufactured in abundant quantities to cater to the demand from various industries such as detergents, kraft pulping, textiles, glass, and carpet cleaners. More than 50% of sodium sulfate is consumed in the powder detergents industry. It is used as filler material in powder detergents. Low price is boosting the application of sodium sulfate in the powder detergents industry. Growth in the detergents industry is driving the demand for sodium sulfate. Commercially, sodium sulfate is employed as a dyeing agent in the textiles industry. Sodium sulfate lowers the negative charges of fabrics. Thus, the dyeing process becomes easier and effective. This, in turns, drives the application of sodium sulfate in the textiles industry. Growth of the global textiles industry is boosting the usage of sodium sulfate as a dyeing agent. Furthermore, sodium sulfate is employed in the glass manufacturing process. It is used as fining agent in the manufacture of scum-proof glass. Demand for dust or scum-proof glass is driven by the growth in automotive and infrastructure sectors. Sodium sulfate is also used to convert wood into pulp for paper manufacturing. Emerging economies in Asia Pacific such as China and India are major producers and consumers of sodium sulfate products. Sodium sulfate is employed as a cleaning agent in carpet cleaners. Additionally, it is used in oil refining and food preservation applications. Glass is also a key application segment of the sodium sulfate market. However, implementation of environmental norms and presence of significance substitutes (such as zeolite and sodium carbonate) are expected to hamper the sodium sulfate market in the near future. Furthermore, rise in preference of liquid detergents over powder detergents is adversely affecting the consumption of sodium sulfate in the detergents industry. Additionally, inclination of consumers toward sulfate free products/detergents is anticipated to inhibit the sodium sulfate market during the forecast period. Based on source, the global sodium sulfate market has been bifurcated into natural and synthetic. Natural is a widely used source of sodium sulfate. It is extensively employed in various applications due to its easy availability and low cost attributes. In terms of application, the global sodium sulfate market has been segmented into detergents, kraft pulping, textiles, glass, carpet cleaners, and others (including food preservatives and oil recovery). The detergents segment accounted for major share of the market in 2017. It is estimated to be a rapidly growing segment during the forecast period owing to the wide consumption of sodium sulfate as raw material and filler in powder detergents. Based on region, the global sodium sulfate market has been classified into North America, Europe, Asia Pacific, Middle East & Africa, and Latin America. In terms of value, Asia Pacific dominated the global sodium sulfate market in 2017. The region is projected to lead the global sodium sulfate market in the next few years. The market in Asia Pacific is likely to expand rapidly during the forecast period. North America and Europe are mature regions of the global sodium sulfate market. The market in these regions is anticipated to expand at a rapid pace due to the presence of key manufacturers. 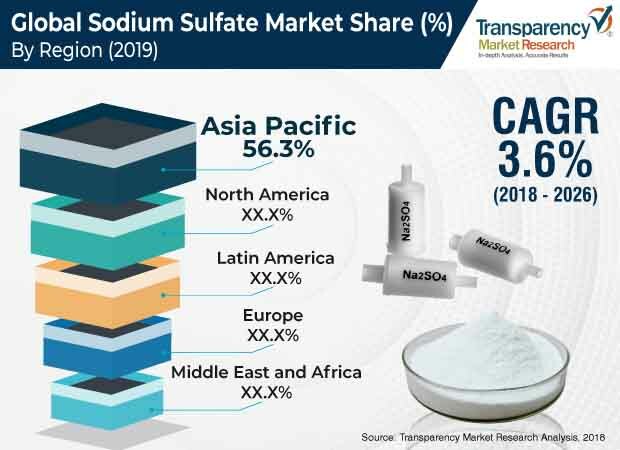 The sodium sulfate market in Middle East & Africa and Latin America is expected to expand substantially during the forecast period due to the presence of emerging economies and growth in textiles and glass industries in these regions. High degree of competition exists among players operating in the global sodium sulfate market. The market is dominated by large players that are technologically sound. These account for prominent share of the market. The sodium sulfate market is capital and technology intensive. Sodium sulfate is also used in high-end applications; therefore, brand image plays a vital role in the market. Key players operating in the global sodium sulfate market include Alkim Alkali Kimya A.S., Birla Cellulose, Cordenka GmbH & Co. KG, Cooper Natural Resources, Elementis plc, Lenzing Group, Minera De Santa Marta, S.A., S.A. Sulquisa, Searles Valley Minerals, Saskatchewan Mining and Minerals Inc., Grupo Industrial Crimidesa S.L., Sodium Sanayii Anonim Sirketi, and XinLi Chemical.